Pixie Dust is thrilled to have played a part of Women’s Entrepreneurship Day (WED) for the second year in a row. Women’s Entrepreneurship Day is celebrated in hundreds of countries and cities worldwide. Its mission is to empower women around the globe to be catalysts of change and uplift the 250 million girls living in poverty. 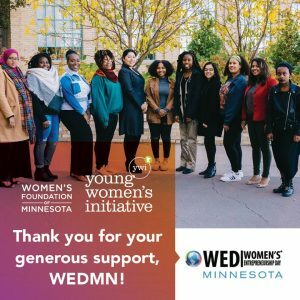 WED MN donated all 2018 ev ent proceeds to the Young Women’s Initiative of Minnesota. The mission: to create a Minnesota where every girl has the opportunity to thrive and is the champion of her own life. 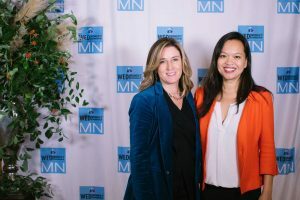 Laura Keller, Pixie Dust Co-Founder/WED Ambassador with Mary Grove, Partner at Rise of the Rest/WED MN Keynote Speaker. Thank you to all of our sponsors and attendees for making a difference! Visit www.facebook.com/WEDMN/ to learn more. Check out the Ad Age article “NOT THE USUAL SUSPECTS: MORE CMOS TAKE WINDING PATHS TO THEIR NEXT JOBS.” We are pleased to see Pixie Dust is included in this leadership conversation. Check out the below Advertising Age article “The Chief Creative Job Has A Murky Future at Big Brands”. We are pleased to see Pixie Dust is included in this leadership conversation. The Chief Creative Officer is experiencing an interesting metamorphosis. The role taps a corporate need, yet the CCO needs 100% support and must navigate often uncharted waters. Adding the CCO role at places like Best Buy, and for the first time at General Mills, is a signal that large corporations seek alignment and quality of the creative strategy and product. Yet, we have seen that the multi-faceted CCO role brings a long list of objectives: to create alignment, minimize cost, consolidate agency partners, influence the work at a high level, and be a valuable partner to an often short tenure CMO in matrixed organizations. We believe the role will continue to evolve, and the demand for a lead creative voice within corporate walls will continue to evolve and grow. Showcase strongest work first. Ensure your proudest moments are the most visible on your site. That campaign you created using groundbreaking technology or an unique idea should be front and center. 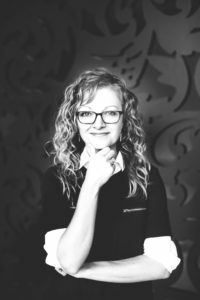 Many choose to go the chronological route, but if an in-house recruiter or ECD has five minutes to review your work before moving onto the next candidate, your best work needs to be visible. Curate your work over the last five years and ensure it is clearly labeled, links are working and the still image best represents the project. For those first starting out in the biz, a minimum of at least six projects should be on your portfolio. Little enhancements are a plus: if a writer also includes great design or thoughtful UX, even better. It shows versatility and well-rounded creative sensibility. Demonstrate your ability to tackle a problem. In order to show your thought process and involvement in the work, a concise introduction to a project can speak volumes. Creatives often don’t get credit deserved for working up front in the research phase, or a problem solved during an edit. Explain the insight, why your message resonated with consumers, how you optimized the work post-launch, or the strategy behind a particular color palette. Examples of collaboration and quick thinking in a summary allow you to vocalize your involvement. It’s also a way to highlight certain characteristics for future roles, i.e., you are an Art Director looking to move up, include successful leadership and client relationship examples to show you possess the qualities for a Creative Director role. Consider your social media shenanigans. Depending on your level of self-awareness, it may be wise to consider removing links to your personal Facebook, Twitter, Snapchat, etc. accounts. Social media is a great way to get to know the true you, so either be thoughtful of your content, or lock it down to avoid derailing a possible dream job. Believe it or not, hiring decisions are affected when you post multiple pictures on Instagram of you drinking PBRs at noon and complaining that no one will hire you (true story). I know of a CCO who will first look at social media before reviewing any ad work. It’s an excellent source for genuine voice, tonality and character. It can help you if done correctly, e.g., to show range if your ad work is serious but you want to convey a sense of humor. Be thoughtful where you guide your audience—there will be plenty of time down to road to expose your faults. Tell your story. Include a page with some semblance of a resume. Of course a LinkedIn page would suffice, but why navigate away from your site? A simple, no frills rundown of places of employment will do, but give it personality so you stand out from the masses. Relevant things to include in this section would be awards, personal interests, contact info and a short bio. If you happen to be an art director, this is a good place to show you can write. If your project work has a predominantly serious tone, here is a place where you can exemplify humor. You get the idea. Concerned you’ve jumped around too much? Then list the agencies to at least give a sense of history. Speak to other creative outlets. Most every agency creative I know also dabbles in other creative outlets. A great mind once told me that pulling from life experience is the best way to generate ideas. You are more likely to mentally connect the dots in different ways if you are creative in other aspects of life. Great advertising agencies will find value in your awesomely weird inventions and peripheral artistic passions. An art director who also happens to be a published author, a writer who paints, poster designers, photographers, musicians, florists, etc. Having another creative outlet lends to the work you do at your day job, so don’t hesitate to showcase those interests. That jewelry design collaboration can position you in a unique way. It shows you don’t only think in :30 scripts, and the end goal is how you differentiate your work from a large pool of candidates. Thoughts on this topic? Shoot us a note with feedback at talent@pixiedustinc.com. What is your leadership blind spot? Are you running at full speed? Find out what might be holding you back from achieving your full potential. Let’s be realistic. An exploration of one’s strengths is inspiring, gratifying, and downright fulfilling. It is the thing(s) you are not seeing about you that might make others less interested in having you as a teammate, boss, or colleague. A Blind Spot is a trait you have that only others see and you do not. That part of your personality you project into the world that might be a roadblock to your personal fulfillment in life and career. Discover how to identify the blind spots in you, and how to identify them in potential hires, co-workers, and friends. In other words, I put the phone down, went out for a cup of coffee, came back, and you are still talking. Sometimes a person that is enormously chatty can be charming. But in business scenarios, oftentimes it isn’t. In an interview, we always encourage the interviewee to be sure the conversation is a true exchange, with balanced listening along with sharing. Do you interrupt people a lot? Do you believe your ideas need to be explained deeply and thoroughly? Do you feel a desire to be heard? Do you nervously talk to fill up space? Do awkward silences make you feel like you are losing your mind? After 10 years of conducting executive recruitment interviews in the marketing and advertising world, Pixie Dust identified common Blind Spots that especially permeate the advertising world —but also business in general—where image counts. The first impression is critical, and keys to success go far beyond skill set. Pixie Dust’s soon to be published book. Blind Spot, written by Co-Founder Laura Keller, is a compilation of 12 stories that each reveal a specific Blind Spot. Find out why your Blind Spot could be a hurdle to rising, and how to address it.